Are Tandy and Tyrone coming back? Is Marvel’s Cloak & Dagger TV show cancelled or renewed for a second season on Freeform? The television vulture is watching all the latest cancellation and renewal news, so this page is the place to track the status of Marvel’s Cloak & Dagger, season two. Bookmark it, or subscribe for the latest updates. Remember, the television vulture is watching your shows. Are you? A Freeform teen superhero drama, set in the MCU, Marvel’s Cloak & Dagger stars Olivia Holt, Aubrey Joseph, Andrea Roth, Gloria Reuben, Miles Mussenden, Carl Lundstedt, James Saito, J.D. Evermore, Emma Lahana, and Jaime Zevallos. The teen superhero drama follows Tandy Bowen (Holt) and Tyrone Johnson (Joseph). These two teens, from different backgrounds, share a strange connection, and have started exhibiting unusual powers. Ty and Tandy soon find they’re better together than alone. The problem is, they are developing feelings for each other, and that makes everything just a little bit more complicated. For now though, it seems the only constants in their lives are danger and each other. The first season of Marvel’s Cloak & Dagger averaged a 0.20 rating in the 18-49 demographic with 572,000 viewers. Learn how Marvel’s Cloak & Dagger stacks up against the other Freeform TV shows. Marvel’s Cloak & Dagger has been renewed for a second season which will debut April 4, 2019 at 8:00pm. Stay tuned for further updates. Will Freeform cancel or renew Marvel’s Cloak & Dagger for season two? The ratings have been dropping but, for now, I think this show will be renewed. I’ll keep an eye on the ratings and update this page with breaking developments. Subscribe for free Marvel’s Cloak & Dagger cancellation or renewal alerts. 7/21/18 update: Freeform has renewed Marvel’s Cloak & Dagger for a second season. Details here. 2/5/2019 update: Marvel’s Cloak & Dagger season two premieres on Freeform on April 4, 2019. Details here. TV show ratings are still important. Follow Marvel’s Cloak & Dagger‘s weekly ups and downs. Find more Marvel’s Cloak & Dagger TV series news or other Freeform TV show news. What do you think? Are you glad that the Marvel’s Cloak & Dagger TV show has been renewed for season two? How would you feel if Freeform had cancelled this TV series, instead? 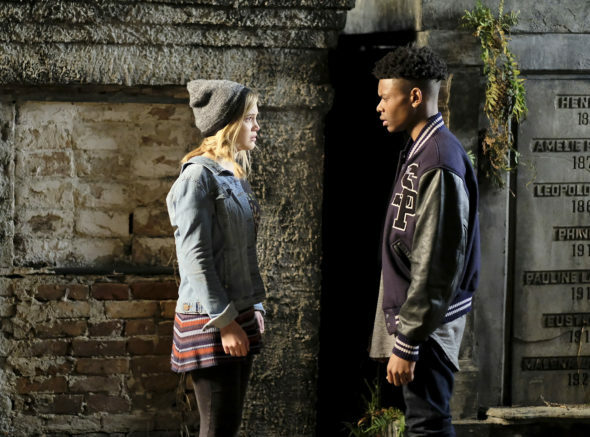 Marvel’s Cloak & Dagger on Freeform: Cancelled or Renewed for Season Three? The first couple of episode were really good . . . then it drove off a cliff. The last few episodes have been comically bad. What happened? Did they dumb it down after focus testing? It’s a shame. It started out with so much promise. Love this show renewed for season 2 and many more seasons to come .